While in Cuba you must visit it’s capital city Havana. Be transported back in time as you explore the colonial streets of this beautiful city. Evidence of its strong colonial background is around every corner you turn with beautiful buildings, homes, castles and cathedrals. The Old Havana area of the city is a UNESCO World Heritage site and is home to over 900 landmarks including the Presidential Palace and Cathedral Square. 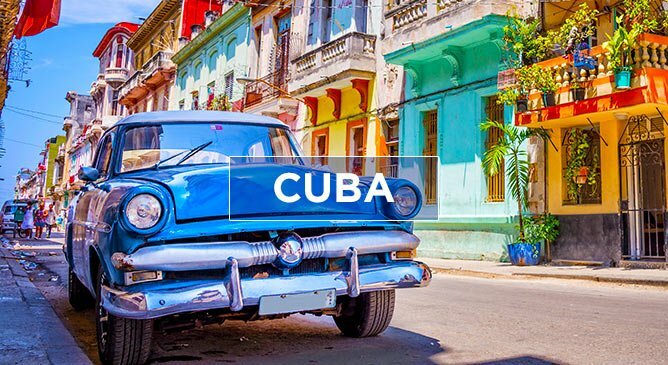 While visiting, take a ride in one of the old restored American cars, dance in one of the many bars and clubs and take in the stunning architecture and culture of this breaktaking city. Cuba has a very unique and beautiful seabed which makes it one of the best scuba diving locations in the Caribbean. Explore the beautiful hidden treasures and coral formations while taking in all of the local marine species. another exciting element of scuba diving in Cuba is your chance to catch a glimpse of the 1000 ships that have gone down in the waters around the island. These include pirate ships and galleons which carried treasures from the New World to the old! So with more than 1000 species of fish, beautiful coral formations and many tunnels and cliffs, scuba diving in Cuba is sure to be an experience you never forget! Cuba has one of the most beautiful beaches in the Caribbean in Varadero. Warm shallow waters and white sandy shorelines make it the perfect place for some relaxation. Along the coastline you will find opportunities to sail, swim and soak up the sun. While in Cuba spending some time on the beautiful beaches is a must.